It is reported that members of Parliament who have been identified for unruly behaviour, ignoring parliamentary ethics in the house may face judicial actions for violating parliamentary privileges and also obstructing the Speaker continuously from performing his official duties. It is further reported that the Deputy Speaker Ananda Kumarasiri who headed the Parliamentary Committee that looked into this ugly behaviour of certain people’s representatives on November 14 and 15, 2018 have already identified the persons who have acted violating the laws of the country. The importance of the Speaker for the smooth functioning and success of the deliberations of the Parliament had been well studied by Dr. N.M. Perera for his doctoral thesis submitted to the London School of Economics in 1931, under the guidance of Professor Harold J Laski. This is a well analysed contribution made as a part of a larger work he attended to a few years later for the DSc of the same university. An important section of this deep and enumerative study has been well highlighted by the Dr. N. M. Perera Centre in its publication in 2002, Parliamentary Democracy, under the heading Speaker as the Guardian of Rights. 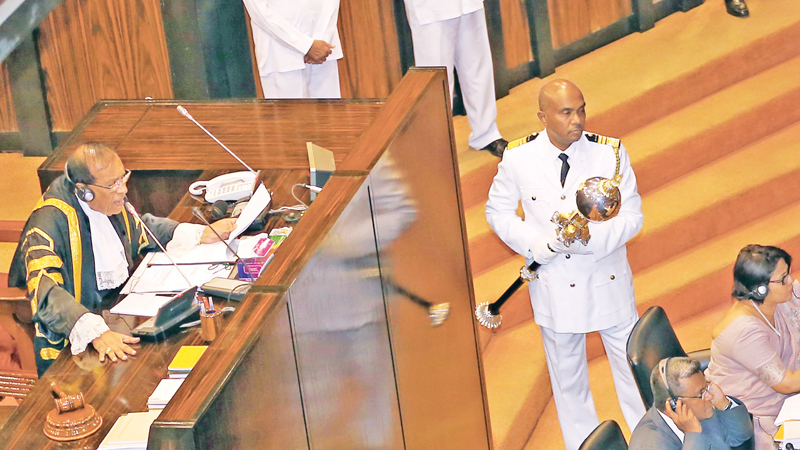 At the very beginning of this chapter, Dr. Perera says: ‘Though nowhere enjoined by law, the very first act of a new parliament is the election of the Speaker, that is someone to preside over its deliberations. No deliberative assembly however small its numbers, least of all this almost unwieldy British House of Commons, can dispense without this officer. Without him, it would be impossible to determine the order in which members should speak or decide between the conflicting claims of those who rise simultaneously… In the absence of such an officer, no motion or question can be put to the House and its votes thereon taken. For this reason, if no other, he is a sine qua non. Speaker of the House of Commons, Lowther, who demonstrated his skills as a senior parliamentarian, very correctly characterized himself as the chief officer of the House, the moderator of its debates, the one and only expositor of its written and unwritten laws and the repository of its ancient customs and traditions’. Almost all the leaders of the democratic countries believe that the Speaker is the impartial judge in all the quarrels and dissensions of the rival political parties which has representation in the House. Further, they believe that all the right-minded speakers should hold the scale evenly among all intransigent groups. In the words of Stanley Baldwin, who dominated the government of the United Kingdom between world wars and was the Prime Minister on three occasions, the Speaker of the House of Commons is the linchpin of the whole chariot and if the Speaker of the House fails to function, the House itself must fail to function as a whole. Baldwin, who acquired long and everlasting rich traditions of parliamentary politics further enumerated the importance of the Speaker in the following words. ‘The Speaker has in a smaller or commensurate degree all the attributes of kingship and like the king, “he can do no wrong”. This illustrious leader of British politics retired in 1937 and was succeeded by Neville Chamberlain. It is widely regarded by constitutional specialists that the Speaker should be elected to the chair unopposed. This accepted principle is meant to ensure more authority to the person who holds this chair and the unanimous voice of the House carries more weight to glorify the importance of his functions and numerous duties. In short, speakership is regarded as an institution. As a general rule, the life of a Speaker runs through beyond the life of a Parliament. In the United Kingdom, he retains his office until the new parliament meets and elects a new Speaker if the members want to introduce new blood to the office. However, the successor should have some experience of the duties and assignments of the chair, before he is invited to undertake the responsibilities upon his shoulders. Dr. NM Perera enumerates in this paper the duties, responsibilities and varied functions of the Speaker in a more elaborate and convincing manner. He is considered to be the agent of the House but always expected to perform these functions in accordance with the aspirations of the House. He conveys the appreciations of the House on various matters for the concerned people. Further, he is also expected to issue warrants to execute the orders of the House for the commitment of offenders, for the issue of writs, for the attendance of witnesses in custody and also for the bringing up witnesses in custody. However, he is not expected to commit a member to the custody of the Sergeant-at-Arms, unless directed by the House. He is entrusted with keeping order in the precincts of the House. Speaker has also some statutory duties to be performed. The Speaker is expected to preside at every meeting of the House, except when the House is in Committee. This is his inherent RIGHT. The Speaker can also without any formal communication to the House, request the Deputy Speaker to officiate temporarily for him. He is expected to make arrangements to distribute the various bills between the varied committees, and has the statutory powers to appoint the examiner of petitions and the referees on private bills. The Speaker is expected to give a hearing to each and every member of the House. In allocating time for the members of parliament to address the House he should be very reasonable and restrained. The Speaker is not merely the agent and instrument of the House, but also the watchdog of the minority in the national interests of the country even overriding wishes of the majority as a temporary measure at times. A different group of opinions should get an opportunity to voice their sentiments. It is the general understanding that greater weight must be placed on those whose opinions and ideas have a likelihood of influencing the House more by virtue of their special competence and knowledge. In parliamentary affairs, he is regarded as the final judge in the acceptability of motions. He has the privilege of altering a motion on his own accord in order to make it more acceptable and precise. The preservation of order during debates in the assembly comes also within his purview. Whenever the Speaker is on his feet, all members are expected to regain their seats. It is an observance more rigidly adhered, and more strictly enforced than a written law or a set of rules and regulations. Without it, there would neither be decorum in debate nor respect for the Chair. He is expected to be more cautious and considerate to distinguish between moments which require firm handling and those which can be tided over by urbanity and civility. If a certain interpretation of a rule by the Speaker is different from that of his predecessors, long-drawn-out arguments on point of order may occur. The history of parliamentary procedure in England has disclosed no such obvious instances, and this may be mainly due to the excellence of his counsellors. In these particular instances, the Clerk of the House and the other members of the Speaker’s Council are well versed in and have a thorough mastery of all the procedural intricacies; the Speaker himself would never express an opinion or deliver a decision but after going through more careful scrutiny of existing precedents. It is a known fact that a well-informed Speaker has the required knowledge and a vast experience before him in the untying of knots. It is the paramount duty of the Speaker to understands all precedents in a corrective perspective and consider the present situations in an objective manner. He must apply this experience according to the present and emerging situation. It is also pointed by Dr. NM Perera in his analysis, where there is neither a precedent nor a rule, the Speaker should allow the House to create a precedent, rather than himself bear the brunt of an unpopular decision. It is the duty of the Speaker to ascertain whether ample discussion had taken before a debate concludes. In this particular situation, he should not allow an infringement whatsoever on the rights of the minority. The Speaker’s Chair should not be dragged into the vortex of party politics. The Speaker should have the determination and the capacity to brave the flood in the House and keep his head above water. The Speaker should prove by example that he is impartial to each and every member of the House. It is this credential that a Speaker can posses to his armoury of fundamental assets. He is not only impartial but the suspicion of partiality must be eliminated. It is the well established practice of the Speakers of House of Commons, in their code of impartiality, to desist wisely from recording their votes in a division, except where it happens to be a tie, in which case they are expected to state their reasons briefly, which are duly entered in the Journal of the House. The Speaker is always expected to deal in affairs of parliamentary procedures, in accordance with the rules of Parliament. In short, he is regarded as a JUDGE of its laws. He also can use this opportunity of drawing new-judge made law, by making use of old decisions. Further, there is no such appeal from the decisions of the Speaker. This deep and penetrating analysis of the functions and the huge responsibilities bestowed in the shoulders of the Speaker demonstrates that the Speaker is the Guardian of the House and the Watch-Dog of parliamentary ethics and procedures. Therefore, it the duty of every member of Parliament to extend their fullest and unstinted cooperation to the Speaker to make the House fruitful, peaceful and beneficial to the whole nation.